(Photo Courtesy: Jen Welling): Flowers were ripped out from the median in downtown Lewiston overnight. Vandals ripped through the downtown area. 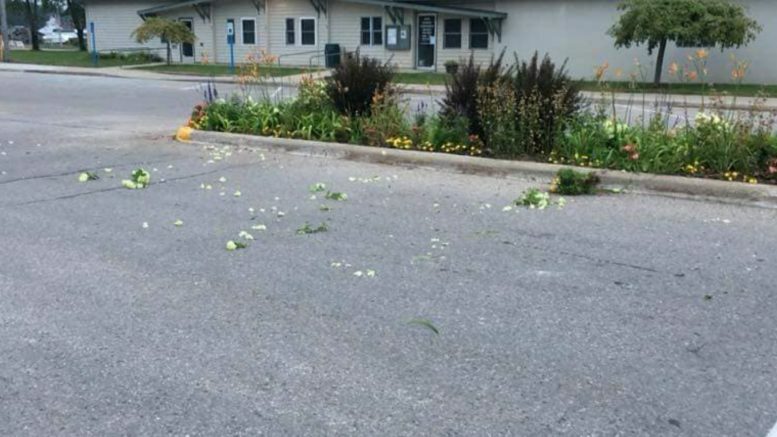 Lewiston — Friday morning, a community awoke to hanging flower pots destroyed or stolen, 10 LED solar lights broken, and flowers ripped up and dispersed all over the street. Vandals struck the two-block downtown area in the night. “It’s definitely not something that happens in our community,” said Resident and Downtown Development Authority Chairperson Shawn Huston. Huston, a lifelong resident, considers this crime a rarity. Several members of the community were heading to work and getting the day started when they noticed the destruction. Around 6:45 a.m. a few of the businesses in the town along with Lewiston Lawn Service put everything aside to start cleaning and re-beautifying the destruction. The whole scene was cleaned up by 8:00 a.m. The response from the community showed pride in a downtown that has seen a resurgence in the past few years. More businesses have opened or revamped. A number of gabions sit at the center of the streets with flowers and solar LED lights. People can find hanging flower pots throughout the downtown businesses. New benches have been assembled for folks to enjoy the quiet and peaceful streets of Lewiston. For a vandal to hit and put the work back, it was extremely frustrating to many residents. Anyone with any information on the vandalism is asked to contact the Montmorency County Sheriff’s Office.